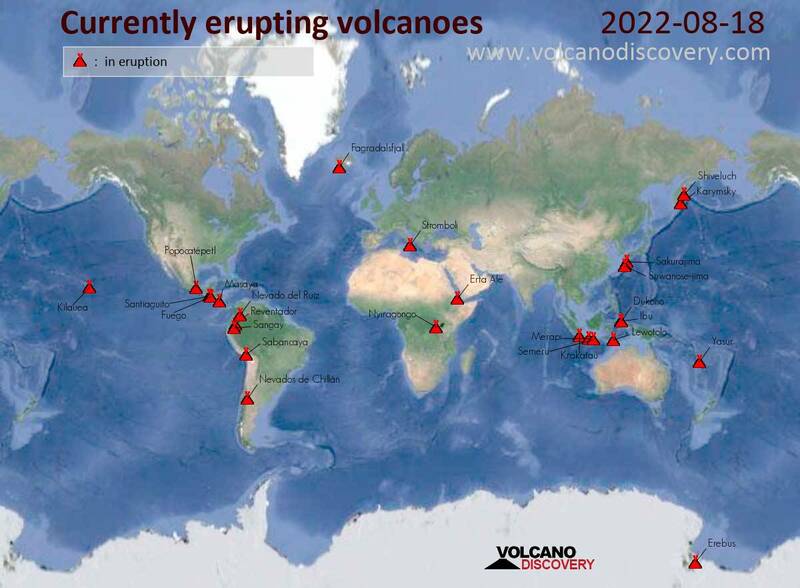 World map showing volcanoes with shallow (less than 20 km) earthquakes within 20 km radius during the past 24 hours on 21 Mar 2019 Number in brackets indicate nr of quakes. Possible earthquake swarm: 32 earthquakes occurred near (under) the volcano during 22 hours, the last being recorded quake 51 minutes ago. Hypocenter depths ranged between 3.8 and 0.0 km. Possible earthquake swarm: 12 earthquakes occurred near (under) the volcano during 19 hours, the last being recorded quake 4 hours ago. Hypocenter depths ranged between 2.9 and 0.4 km. 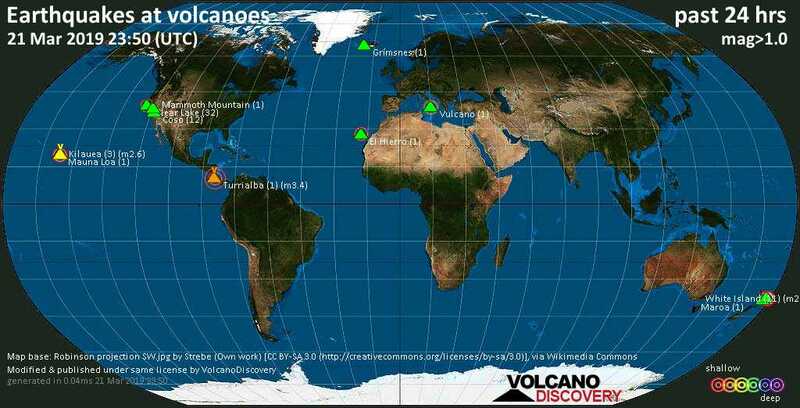 3 earthquakes occurred near (under) the volcano during 11 hours, the last being recorded quake 10 hours ago. Hypocenter depths ranged between 9.0 and 7.3 km. A magnitude 3.4 earthquake occurred at the volcano 19 hours ago. The quake, which might be volcanic in origin, was located at a depth of 3.0 km depth at 14 km distance SE from the volcano. A magnitude 2.2 earthquake occurred at the volcano 6 hours ago. The quake, which might be volcanic in origin, was located at a depth of 12.9 km depth at 7 km distance E from the volcano. Possible earthquake swarm: 11 earthquakes occurred near (under) the volcano during 20 hours, the last being recorded quake 54 minutes ago. Hypocenter depths ranged between 8.0 and 3.8 km.